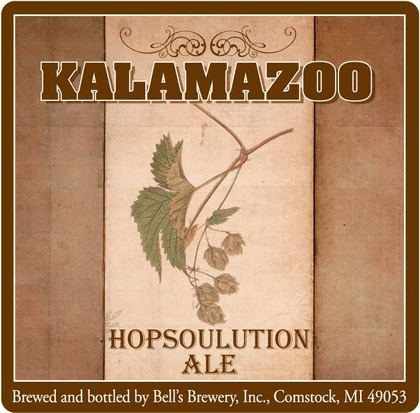 Kalamazoo, MI's Bell's Brewing Company has consistently produced some of the most painterly beer art, and their expansion into the mini-keg packaging has provided a new set of canvases for them. Like my beloved cans, minikegs offer close to a 360-degree opportunity for art. 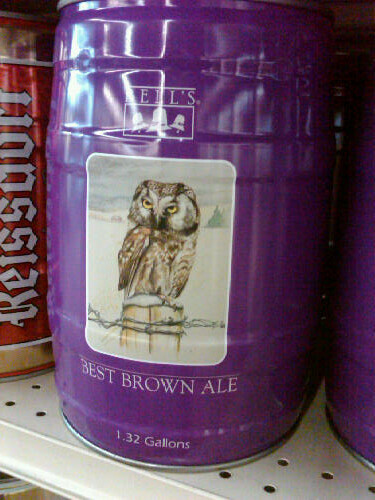 Take a look at their mini-keg art for the aptly named "Best Brown Ale:"
For those of you who have seen the Hungover Owls e-phenomenon, it is clear that this owl might want you to leave him alone so he can shower. Seriously, though, that's great work, from the detail in the red leaves and the owl's expression to the way they shade the background to make the serif typeface easily readable. So, let's agree that that's an upgrade and then some. Again, we have a restrained, peaceful look at nature that suggests the brewery's inspiration and identity. This isn't a West Coast hop destruction brewery, or a humor-driven comic one, but a place with a reverence for the geography and character of the Midwest. Again, the use of asymmetry and framing make the otherwise unremarkable lettering a point of focus. They do a lot with detail, including the fact that all of the trees and even unseen branches have shadows. 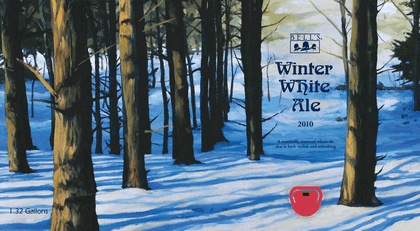 Despite all of the blue and brown, the image radiates a wintry white. I had a great picture from the TTB of the new Two-Hearted mini-keg art, which was fantastic and looked like a stained glass image of nature. But the link is gone and I can't find another image. I'll post it later if I can find it. The really interesting thing about the piece is the use of impressionist-style blurring around the edges of a black and white image. I think it's an attempt to model the way our eyes see in the dark, when the cone cells (which pick up color and detail) work less well and the rod cells take over. We see vague outlines, enough to make out a mysterious image, but not enough to really understand what we're seeing. The only flaw I see is the lack of a believable linear perspective as the trees fade back. 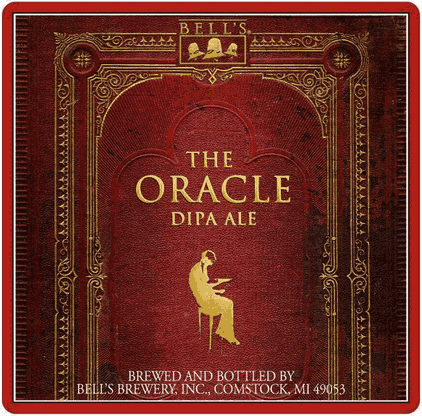 The artwork for the Oracle Double IPA uses some Eastern Orthodox imagery to convey a royalty (perhaps to connote the "imperial" nature of a Double IPA?). For a beer called the Oracle I would have expected the theme to be ancient Greek, but 18th-19th century Russian/Ottoman works, too. Nice piece, just not sure I get it. Let's end with the Hopsolution. 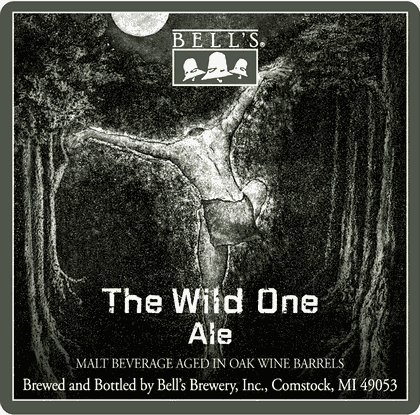 This is how many of the Bell's old-timey labels look, with a faded or sepia-toned color palette. In this case, the hop branch looks something like one of the old Audubon prints, with classic techniques of botanical illustration. The only problem here is that the image isn't big enough, so the brown bars on the sides take up almost two-thirds of the image. Compare that to the vast, intricate natural vistas we saw above, and you can see why the redesigns are so successful. Love the Winter White label. Reminds me more of a forest in the Poconos than it does of the midwest, though. (I've spent considerable time in both locations.) Regardless, it's a lovely, evocative image.